ORDER THE first ISSUE OF MY NEW PHOTOGRAPHIC JOURNAL! After a lot of thought about how to make my work available to you in high-quality print at an extremely affordable price point, I have decided to publish a quarterly photographic journal. This is a premium fine art photographic magazine, produced using the best quality and most expensive on-demand magazine printing service available. We wanted to achieve excellent image quality, paper quality, and overall durability. I have over 15 years of experience in professional graphic design and pre-press, in addition to over 12 years and 2 million images of photographic experience. My wife Erica holds an English degree and teaches English full-time at a private school. Between the two of us, we easily have the experience and skills necessary to create a printed publication with world-class production values. So we decided to make one for you, in order to get this work into as many people’s homes as possible in a convenient and accessible format. The journal is titled, “Salt & Light.” Each issue will have a theme and will contain a series of related images, stories, essays, & quotes. “Salt & Light” is a collectible fine art photographic journal. 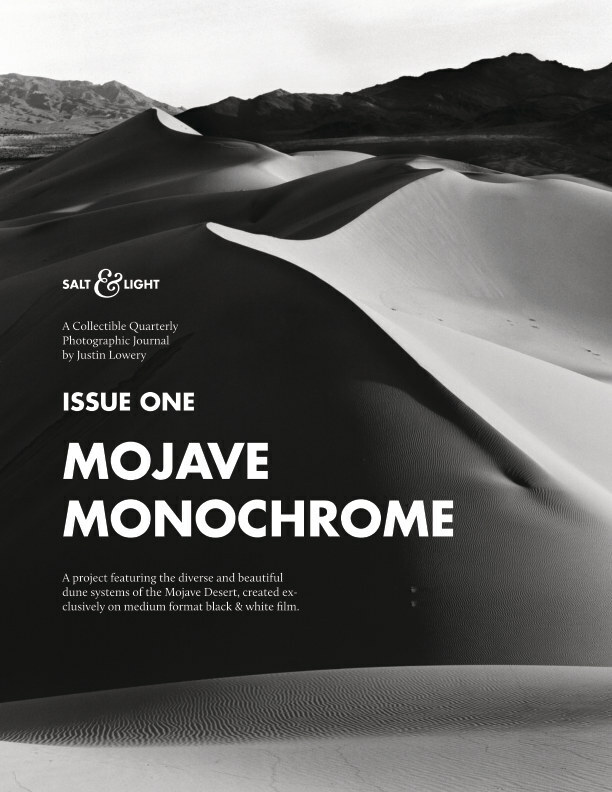 This issue is titled, "Mojave Monochrome" and features an exquisitely tailored collection of images that we have selected together to represent this project. It also contains several essays and stories discussing my experiences in the wilderness areas of the Mojave Desert, thoughts on artistic philosophy, fine art film photography, and environmental conservation. There is also a collection of some of my favorite quotes from various notable and historic authors on these subjects. The magazine measures 8.5 x 11 inches, and some of the vertical images are printed full-bleed, so they are larger than an 8x10” print. We looked at a lot of zines from other photographers and came to the conclusion that we wanted to offer something different from what we saw on the market. The majority of self-published zines seem to be primarily a photographic portfolio, with all the emphasis being on images and captions. While this is an excellent and very enjoyable format, for me personally as an artist, I feel that my writing is the element that allows you to get to know me, join me on my adventures, and see behind the lens. I take you with me on the ups and downs, the early mornings and late nights, the frigid temperatures and howling winds, and the sweet smell of desert Verbena in the evening! We decided to make this a true "journal" in that it is divided evenly between images and writing. Every other page is either a full page image or a full page of text, and in this way, the journal has a nice rhythm and flow to it. The images were very carefully curated from a larger body of work, and represent the current best of my ongoing Mojave Monochrome Project, which is a photographic exploration of the dune systems of the Mojave Desert. We picked 12 images because it is an even dozen and we wanted to force constraint in order to ensure quality. The roughly five to six thousand words of the text were thoughtfully authored over a period of two weeks and edited numerous times in an effort to best convey my thoughts and feelings to you, the beloved reader. This issue showcases a project featuring the diverse and beautiful dune systems of the Mojave Desert created exclusively on medium format black & white film. The issue also contains several essays detailing my experiences in the dune fields of the Mojave Desert, as well as some philosophical thoughts on art, wilderness photography, and environmental conservation.